When many Americans think about Black History Month, the operative word is “history.” They take what might be called a”history was then” perspective. For that group, February is a time to remember and regret how bad things used to be and to celebrate a few of the household-name heroes who helped expose and reform the deep and blatant racism of our past. Though some of the racist practices are still quite fresh — gruesome lynchings, hateful Ku Klux Klan rituals, law enforcement officers unlatching fire hoses, unharnessing billyclubs, and unleashing police dogs on civil rights activists — the “history was then” crowd finds those images both disgusting and reassuring. Look how far we’ve come. One psychology experiment — commonly called the “doll test” — famously illustrates those bad-old days. 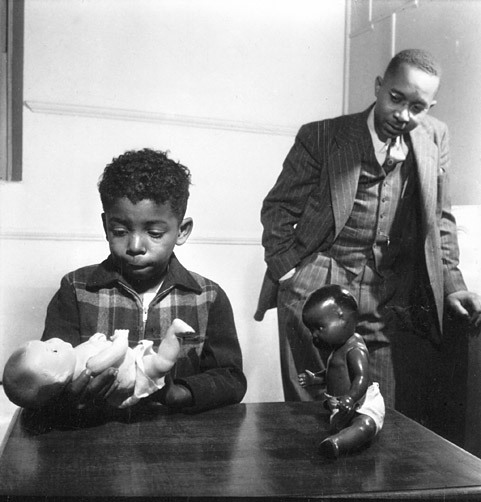 In the mid-1950s the wife-and-husband team, Kenneth and Mamie Clark, asked black children, ages three to seven, a series of questions about some plastic baby dolls that were identical except for color. The responses brought a latent reality into black-and-white relief. Ten of sixteen of the young black children preferred the white dolls to the black dolls. Furthermore, they attributed more positive characteristics (e.g., “good” and “nice”) to the white dolls. The Clarks concluded that “prejudice, discrimination, and segregation” caused black children to develop a sense of inferiority and self-hatred. Soon thereafter, those disturbing findings would help to shift public policy and interpretation of the law. Indeed, they figured prominently in several legal cases, the most important of which was Brown v. Board of Education of Topeka, 347 U.S. 483 (1954). 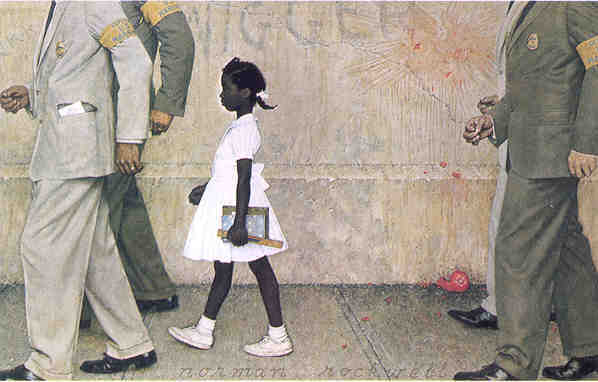 In that landmark case, which examined Jim Crow’s “separate but equal” public-school education system, the U.S. Supreme Court was presented with this fundamental question: “Does segregation of children in public schools solely on the basis of race, even though the physical facilities and other ‘tangible’ factors may be equal, deprive the children of the minority group of equal educational opportunities?” The Justices’ unanimous answer of “yes” depended significantly on the argument that state-enforced separation denotes inferiority which is internalized by the students to their detriment. The doll test was offered as evidence of that dynamic. The “history was then” contingent would, we suspect, gasp at the results of the doll test and then point to Brown v. Board as evidence of how the laws, not to mention our customs and sensibilities, have all changed since 1954. That was then, and this now. Look whose running for President! Look whose coaching head-to-head in the Super Bowl! Look at Oprah and Tiger — they are so famous and beloved, not to mention wealthy, we can dispense with their last names. No longer is “black” somehow “inferior.” The doll test is interesting today as a milemarker of the distance we’ve come in just fifty years. Kiri Davis, a seventeen-year-old student at Manhattan’s Urban Academy, falls into the “history is now” camp. Like Kenneth and Mamie Clark five decades earlier, Davis has publicly documented how progress is often more imagined than real. In her award-winning documentary, “A Girl Like Me (2006),” Davis recorded how she duplicated the Clarks’ doll test among young girls in Harlem. Davis became interested in the project–which has drawn the praise of many, including Deborah Archer over at BlackProf–when she, like many teenagers, came to understand that beauty is not only skin deep, it is tone sensitive. So, “show[ing] them” was what she set out to do. Davis replicated Kenneth and Mamie Clark’s famous study, and observed the very same behavior in her subjects: a majority of young black girls regarding white dolls as prettier and more likeable than black dolls. History is now. The child, a preschool-aged Black girl, quickly picks up and shows the Black doll over a White one that is identical in every respect except complexion. “And why does that look bad? “Because she’s Black,” the little girl answers emphatically. “And why is this the nice doll?” the voice continues. The little girl hesitates for a split second before handing over the Black doll that she has just designated as the uglier one. Unfortunately, Kiri Davis’s compelling video is barely a drop in the bucket of evidence that social scientists have amassed indicating the continued influence of robust race-based stereotypes and prejudices. Worse still, the evidence is that those beliefs and feelings are not limited to children’s attitudes toward dolls or to the beauty sense of teenagers. They are ubiquitous. And here may be the worst part: whatever our conscious or explicit attitudes and intentions, today’s social psychologists have discovered a set of biases that operate beneath the radar of those salient, accessible, and misleading cognitive features. In the Race IAT, subjects take a timed test in which they are shown a computer screen and asked to match positive words (love, wonderful, peace) or negative words (evil, nasty, failure) with faces of African-Americans or Whites. Very roughly, subjects who take less time to link positive words with Whites and more time to link positive words with Blacks—or who are quicker at connecting negative words with Blacks and slower at connecting negative words with Whites—demonstrate an implicit bias for white faces or against Blacks. You can take the test yourself by clicking here. Millions of people have. And, among other findings, the IAT test reveals that approximately three-quarters of White subjects and half of the Black subjects show such a bias. Think of this as the post-PC example of the doll test. History is now. But wait a minute. If the bias is only implicit and subconscious, how important can it be? Here, too, the news is bad. Although the research is by now piled high and the findings, at time complex, the results can be fairly summarized as follows: implicit bias influences behavior in the way that we assume (often incorrectly) explicit attitudes do. Put differently, the “attitudes” that we do not perceive in ourselves are often more powerful in shaping our conduct than are the attitudes of which we are conscious — situation eclipses disposition. The vast majority of studies designed to examine the influence of race in capital punishment have found that murderers of White victims are much more likely than murderers of Black victims to be sentenced to death. Drawing from an extensive database compiled by David Baldus, she and her colleagues obtained the photographs of Black defendants who were death eligible in Philadelphia from 1979 to 1999. She presented the faces of Black defendants who had killed White victims to naive participants (who did not know that the photographs depicted convicted murders) and asked them to rate each face on how stereotypically Black it appeared. The effect of stereotypicality was clear. Whereas only 24% of the defendants rated as less stereotypically Black received a death sentence, 58% of the defendants rated as more stereotypically Black received a death sentence. 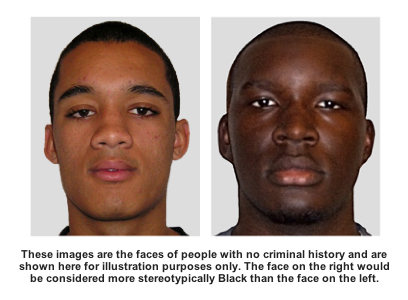 This stereotypicality effect was significant even when controlling for defendant attractiveness and the most significant non-racial factors known to influence sentencing (i.e., aggravating or mitigating circumstances, murder severity, defendant socioeconomic status, and victim socioeconomic status). It seems that jurors view criminal defendants in very much the same way that young children see dolls. White is good. Black is bad. Very black is very bad. To paraphrase Cornell West, race still matters and history is a fundamental lens for seeing what we would otherwise like to deny. In West’s words, “[a] fully functional multiracial society cannot be achieved without a sense of history and open, honest dialogue.” History is now. This entry was posted on February 14, 2007 at 11:23 am	and is filed under History, Implicit Associations, System Legitimacy. You can follow any responses to this entry through the RSS 2.0 feed. You can leave a response, or trackback from your own site. You neglected to mention a great study on Afrocentric features and sentence length: Irene V. Blair, et al., The Influence of Afrocentric Facial Features in Criminal Sentencing, 15 Psychological Science 674 (2004). It’s more comprehensive than the Eberhardt study – albeit on a slightly different topic – because it examined Afrocentric feature bias among black and white Americans. It seems Afrocentric feature bias affects all of us. See William T. Pizza et al., Discrimination in Sentencing on the Basis of Afrocentric Features, 10 Mich. J. Race & L. 327 (2005) for a comprehensive summary of research. Although Kang, Banaji and Krieger have all taken several commendable whacks at Implicit Bias, I remain entirely unconvinced that we can do anything about it, pragmatically or legally. Other than that, great, and depressing, post. Many people take the evidence of implicit bias as suggesting that matters are hard wired, that change is impossible. Actually, much of the science suggests otherwise, although the technique of decreasing implicit bias might require indirect, environmental, situational methods. In any event, as detailed in both Trojan Horses of Race (Harvard 2005) and Fair Measures (with M. Banaji) (Cal. 2006) (both pieces available at http://jerrykang.net), there are various techniques that may help debias us. And various methods will not and should not pose legal difficulties, although almost all raise provocative questions. The Clarks concluded that “prejudice, discrimination, and segregation” caused black children to develop a sense of inferiority and self-hatred. It’s odd that anyone takes this research seriously any more. Segregation is bad, but not because of Clark’s doll tests. We might say of a friend who’s always in trouble, that he has a “dark side”. I love it, America cannot hide from the truth, the bed we have made shall give restless sleep to the people of this country unless, we take away a lesson from this and act upon it. I would like to see the test done in reverse, with young white children(should prove very interesting). you actually recognise what you’re talking about! my comment didn’t show up. Grrrr… well I’m not writing all that over again. Anyhow, just wanted to say fantastic blog! him as nobody else know such targeted about my trouble.